The H.S. Choir is comprised of 9th-12th graders that desire to worship the Lord through singing!!! 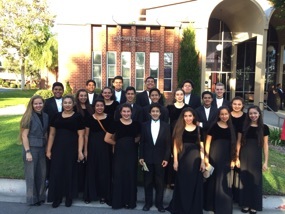 They have performances throughout the year, which includes school concerts, performances in the Downey community, and CCCS musical theater productions. The H.S. 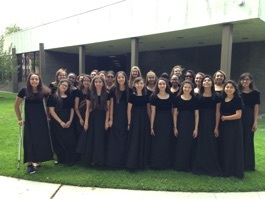 Choir is focused on good vocal production, music theory, sight-reading, and rehearsal etiquette. However, the most important goal is to train these students to worship the Lord through their whole life and to prepare them to succeed in college and beyond. The Honor Choir “Remembrance” is a select group of singers from the H.S. Choral that display leadership, good vocal production, and advanced music theory. They have the same amount of performances as the regular H.S. Choir plus a few extra performances in smaller venues. The goal of Honor Choir is to place advanced students into a setting where they can hone their musical skills and cover advanced material. Students involved in Remembrance usually are seeking to study music in college or be involved with music throughout their life. ALL choir students have the opportunity to earn 3 units of college credit through Hope University if they enroll in choir for a full year. See the Registrar for more info and enroll by December!